The MBU Timeline Broadcast plays every Thursday before Chapel, but have you ever thought about how much work it takes to make it happen each week? The process begins far in advance of the screening as the team works the entire week prior to airing, shooting and editing all the footage they need for the show. Filming events around MBU takes plenty of teamwork, according to the broadcast team, which consisted of only three students last semester. Haley Sandvoss, a senior public relations major from St. Louis, who has been in the Studio Production class for two semesters and worked with a four-member team last spring, said it is difficult to work out the jobs for recording chapel with just three workers. “With there being three of us, that doesn’t give us enough people to cover the positions needed for a chapel production,” Sandvoss said. The team currently runs three cameras to record chapel. With just three students, this means that one camera is left unattended because one student must act as director, run the switcher and handle the graphics. Team members agree recording for the MBU Timeline Broadcast is an easier feat for the trio because it takes place in the Broadcast Studio and there are only three essential jobs when recording the anchor shots. One team member mans the camera, another works the prompter and the remaining team member acts as director and helps make executive decisions. “We’ve adjusted [to the small team size] by making a rotation [between responsibilities]. It also helps when you have good communication between everyone,” said Giovannica Johnson, a senior broadcast media major from St. Louis, who worked last semester as the team’s co-director/co-editor. Having students who are able to communicate with each other and work around all of their conflicting schedules seems to be key to making the MBU Timeline Broadcast possible. Not only are the students working hard to make this possible, there is also a new instructor to the program, Alonzo Medcalf, instructor of communications and multimedia production, who joined the MBU Communications Department faculty last fall. Medcalf joined MBU as an instructor after working four years for KMOV-4 as a videographer, where he was awarded with a regional Emmy for his news work. 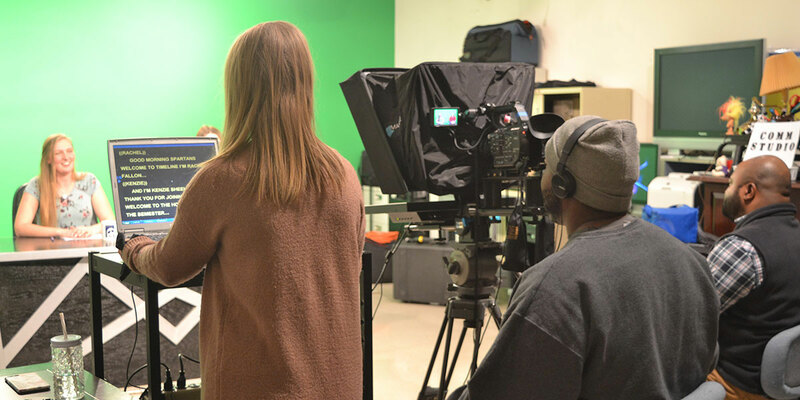 Sandvoss, who also anchors the MBU Timeline Broadcast among her many duties in the program, recalled the first day of the Studio Production class. 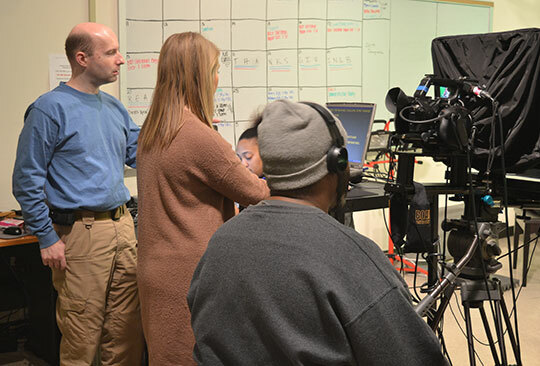 Ricky Janzen, technical director, left, works with students during the weekly shooting of the MBU Timeline Broadcast. Anchors/reporters promoting the show on social media. Anchors talk (banter) with each other, creating a more casual experience. Create a newsroom (invisible, virtual, makeshift, etc.). New set: desk, monitor, more green screen, etc. Anchors use iPads for reading scripts. New MBU Timeline Broadcast intro: title, graphics, music, etc. This semester there are eight students in the studio production class, which is a significant leap from three, according to Medcalf. “What I can say is, [a bigger team] will make the end product much better because we can incorporate more elements to the broadcast,” Medcalf said. As for last semester, the team got everything done by having many helping hands, including Ricky Janzen, who works for Medcalf as technical director at MBU. “Ricky is the technical brains behind the operation. If something breaks, he fixes it. If cable needs to be run, he will run it,” Medcalf said. Janzen often works directly with the students. Other than Janzen, the team also gets help from the Intro to Audio and Video students, who often volunteer their time to help film sports games and other events happening around campus. The Timeline Broadcast airs every Thursday before Chapel service, which takes place from 11-11:45 a.m.